Orthopedic dog boots are essential for injured, disabled and elderly dogs who have trouble walking, drag their feet, or have paw injuries. When we humans have problems with our feet, back, legs, or hips we don’t hesitate to buy special orthopedic shoes to make us more comfortable, or at least inserts for our shoes that might make the issues more tolerable. Why shouldn’t we do the same for our four-legged loved ones? These boots provide better traction on slippery floors such as hardwood, ceramic and tile and give relief to impaired and arthritic dogs. 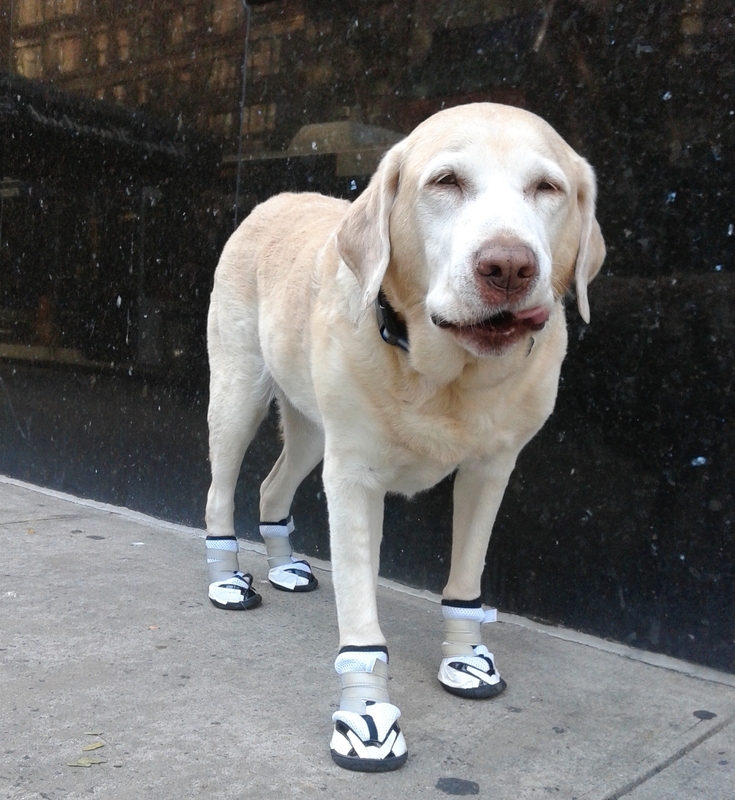 Non slip dog boots are essential for aging pets. Why does your dog need orthopedic or non-slip dog boots? Dogs of all ages, especially the bigger breeds like Labs, Golden Retrievers, and German Shepherds, are prone to things like hip dysplasia and degenerative myelopathy, both of which can ultimately result in osteoarthritis. The most important thing to know about these afflictions is that they can cause discomfort as the dog walks and make them walk with an unusual gait. These altered gaits can often result in their feet rubbing, scraping, or dragging paws on the ground, causing your dog even more problems. A set of boots can help with these issues. Veterinarians recommend orthopedic boots to protect your dog’s feet from getting injured toes and paws from dragging or from protecting already scraped, tender feet from further injury. These boots are padded and even offer extra support for tender painful paws, giving them time to heal. Some styles wrap tightly around the leg, not just on the paw. This is ideal if your pooch has a broken leg, adding stability when he or she is able to walk on that leg. Another perfect reason for your dog to have comfortable shoes is to protect older, arthritic paws from the cold in the winter. Even a dog without foot and leg issues will appreciate keeping his paws off of the cold snow and ice in the winter and hot, steaming pavement in the summer. What better way to make your pooch more mobile and comfortable and able to still enjoy their daily walk? For some dogs, no matter how old they get, these walks can be the highlight of their day.